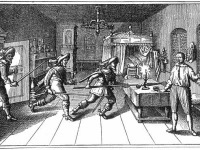 On June 13th 1782, the maidservant Anna Göldi from the tiny Swiss canton Glarus was executed by the sword as being one of the very last women in Europe condemned for witchcraft. Concerning her case also for the very first time the term ‘judicial murder’ has been coined. 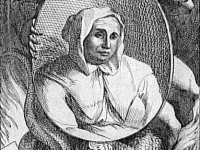 Anna Göldi came from a poor background and for seventeen years, she worked as a maidservant for Johann Jakob Tschudi, a physician, magistrate and rising political figure. We know from records of the time that Anna Goeldi was a tall, generously proportioned woman with dark hair, brown eyes, and a rosy complexion. These attributes were not lost on her employer. Tschudi reported her for having put needles in the bread and milk of one of his daughters, apparently through supernatural means. At first, Anna Göldi managed to escape the immanent arrest, but the authorities of the Canton of Glarus advertised a reward for her capture in the Zürcher Zeitung on February 9, 1782. When she was arrested, she admitted unter heavy torture to entering in a pact with the Devil, who had appeared to her as a black dog. She withdrew her confession after the torture ended, but was sentenced on June 13, 1782 to execution by decapitation. Please keep in mind that this did not happen in the dark Middle Ages, but in 1782, at the height of Europe’s so-called Age of Enlightenment. The charges were officially of “poisoning” rather than witchcraft, even though the law at the time did not impose the death penalty for non-lethal poisoning. During her trial, official allegations of witchcraft were avoided, and the court protocols were destroyed. The sentence does therefore not strictly qualify as that of a witch trial. 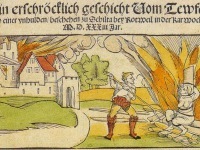 Still, because of the apparent witchhunt that led to the sentence, the execution sparked outrage throughout Switzerland and the Holy Roman Empire. On September 20, 2007 on the occasion of her 225 anniversary, the Swiss parliament decided to acknowledge Anna Göldi’s case as a miscarriage of justice and called for Anna Göldi’s exoneration, which was granted on August 27, 2008 on the grounds that she had been subjected to an “illegal trial”. 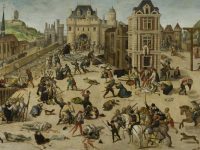 At yovisto, watch Prof. Teofilo Ruiz from UCLA presenting ‘The Terror of History: Witchhunt in Early Modern Europe‘ to learn more about the darker sides of the Age of Enlightment.